(Telegraph) – THE TRUE SCALE of the public spending pain that awaits whichever party wins the election was laid bare by the unanimous verdict of the Chancellor and his Conservative and Liberal Democrat counterparts in a live television debate. During the debate on Channel 4 Alistair Darling, George Osborne and Vince Cable were asked how deep cuts will need to be to restore Britain’s economic credibility. They all agreed that the cuts would have to be tougher than those imposed by Baroness Thatcher in the 1980s. The discussion was a curtain-raiser for the party leaders’ ground-breaking television debates that will take place once the election is called. The Chancellor last week surprised other Labour figures when he allowed himself to make the comparison with the Conservative government of the 1980s. All three men are likely to be privately happy with their performance but no one managed to land a knockout blow. There had been concerns from some in Tory ranks that Mr Osborne would struggle to make an impact, but in the 50 minute debate he stood his ground on the key economic issues and made Mr Darling shift uneasily over Labour’s plans for a death tax. Mr Cable, who claimed he was the only politician of the three to have experience of industry and the only one to have warned of the impending crash, was able to tap into the audience’s apparent distrust of the other two parties. He was applauded and got one of the very rare laughs from the Channel 4 audience. Mr Osborne had to withstand what appeared at times to be an attempt by Mr Darling and Mr Cable to gang-up on him. Mr Cable, who got more applause from the studio audience than his two counterparts from the main parties, got very personal in his final comments. But Mr Osborne kept his cool and made a direct appeal to voters saying they would be able to make the choice between change or more of the same after 13 years of Labour failure. The shadow chancellor has been under pressure in recent weeks to show that he can articulate the true scale of the problems facing the country and translate it into vote winning rhetoric. He repeatedly referred to how it was the “audience’s money” and “the people at home” who were paying for Labour mismanagement of the economy. But the debate was also characterised by a number of areas on which the three parties seemed in agreement. They included the new 50p tax rate for top earners, reform of public sector pensions the need to keep options open on future VAT increases. Mr Darling attempted to seize on Mr Osborne’s decision yesterday to say that Whitehall cost savings would be used to reverse part of Labour’s planned National Insurance rise. In the immediate aftermath of the debate Ladbrokes cut the odds on the Conservatives winning a majority from 4-6 to 8-13. But in a sign that Mr Cable was probably the winner of the debate his odds on delivering the next Budget – as a Chancellor in a coalition government – were cut from 16-1 to 12-1. Mr Cable also won the largest share of the Channel 4 viewers’ cote as the show came to a close. Mr Cable received 36 per cent of the vote, Mr Darling 32 per cent and Mr Osborne 31 per cent. (Daily Mail) – DAVID CAMERON yesterday watered down his plans to take an axe to state spending. The Tory leader promised he would tackle the deficit immediately but said cuts did not have to be ‘particularly extensive’ at first. His comments suggest a softer approach to the public finances amid warnings of a possible double dip recession. Chancellor Alistair Darling has warned that over-hasty deficit reduction could derail economic recovery. Speaking at a lunch with business leaders, Mr Cameron said: ‘Plans that don’t start now are not particularly meaningful. I think you have to see some early action. He has promised to tackle the record £178billion budget deficit following the release this week of weaker-than-expected growth figures. Mr Cameron has warned Britain faces a Greek-style debt crisis unless cuts begin this summer along with ‘bold’ steps to reinvigorate the economy. In a speech at the World Economic Forum in the Swiss ski resort of Davos, the Tory leader said: ‘Our reputation rests on rejecting the course of inaction and the path of least resistance. ‘Instead we must be bold enough to make the right judgment – however difficult that may be – to ensure the long-health of our economy and restore Britain’s reputation on the world stage. Conservative sources denied that Mr Cameron was rowing back on his pledge to cut spending. But Vince Cable, LibDem Treasury spokesman, said: ‘The Tories’ confused statements about cuts show that they don’t really know what to do about the economy. ‘In their desperation to sound tough on public spending, the Tories didn’t take economic reality into account. ‘It is of course necessary to cut public spending but this must be done when the economy is strong enough to cope. Treasury chief secretary Liam Byrne said: ‘Just as Britain’s families and businesses have fought through from recession to recovery, Mr Cameron offers a betrayal in the mountains of Davos. ‘Instead of backing Britain’s recovery, he dogmatically insists he’ll slam on the brakes come what may – even if it forces a double dip recession. Last year, Mr Cameron outlined £7billion a year of cuts to public services – including an end to tax credits, baby bonds and a cap on public sector pension payouts. (Telegraph) – David Cameron will today set out the manifesto he hopes will win the general election while dispatching members of the shadow cabinet to seize the initiative with voters in marginal constituencies. He will place the economy at the top of his party’s agenda, in a speech at Westminster. The Conservative leader will also unveil plans for the NHS, including a shake-up of maternity services to provide better support for pregnant women. Advertising posters bearing Mr Cameron’s photograph will go up in 1,000 locations today, while eight members of the shadow cabinet will fan out across the country to campaign in key marginals. The scale of the advertising blitz is likely to worry Labour, which is already concerned at the size of the Conservative election war chest. The boldness of the move reflects Mr Cameron’s determination to start the election year on the front foot and to push ruthlessly for the votes of those in the seats that decide elections. In his draft manifesto speech, Mr Cameron will refer to the financial crisis and record national debt, saying: “We cannot go on like this. This is no time for business as usual. This is no time for more of the same. He will also put the family at the heart of his policies and make a commitment to handing power back to the electorate, saying: “We need to bring down the deficit so we can start to regain our position as a world-leading economy. “We have to strengthen families and reform schools so we can start to build the big society. The economy will be the biggest issue in the election campaign and both parties are already involved in attempts to seize the initiative by painting the other party’s plans as unrealistic. The Conservatives say the deficit needs to be tackled in the main by public spending cuts. George Osborne, the shadow chancellor, will promise to reform unaffordable public-sector pensions while scrapping some middle-class benefits such as child tax credits for the better off. Labour will counter-attack this morning with Alistair Darling, the Chancellor, disclosing a 100-page dossier which he will claim catalogues a series of policy spending promises that the Conservatives have committed to, but which are not achievable. He will attempt to pick apart Tory plans in the same way that the then-Conservative government took apart Neil Kinnock and John Smith’s economic policies in 1992 before snatching election victory. Mr Brown was accused on Sunday of not accepting reality by arguing that the deficit could be reduced while increasing public spending. He said tax rises would contribute to a halving of the £178billion deficit within four years. Vince Cable, the Liberal Democrat treasury spokesman, said Mr Brown’s plans were “simple fantasy”. Mr Brown maintained that if the Conservatives wanted to pay down the deficit at a faster rate they would have to say where they would make cuts. “If you want to halve the deficit more and more quickly you will inevitably hold this country in recession longer,” he told BBC One’s Andrew Marr Show. The Prime Minister seized on comments by Ken Clarke, the shadow business secretary, in The Sunday Telegraph, in which he left open the possibility of an increase in VAT. Today, the shadow cabinet’s leading members will visit areas where Mr Cameron needs to win support to secure a significant Commons victory. Michael Gove will be in Nottingham, Chris Grayling in Reading, William Hague in Yorkshire, Nick Herbert in Southampton, Oliver Letwin in Plymouth, Theresa May in Bristol, Eric Pickles in Luton and Baroness Warsi in Bury. 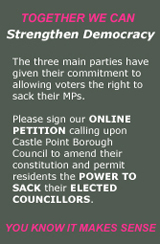 Among the Tory objectives is to court Lib Dem supporters in case there is a hung Parliament. The polls still show that Mr Cameron, who visited the maternity ward of the Chelsea and Westminster Hospital in west London yesterday, is heading for a majority, but a hung Parliament remains a possibility. Conservative research has shown that nine out of 10 Lib Dem or undecided voters in the top 18 Lib Dem-held seats targeted by the Tories would prefer Mr Cameron to Mr Brown as Prime Minister. The Tories still think Mr Brown could opt for a March election date. However, he does not have to call an election until June 3 and May 6 remains the most likely date. (Telegraph) – HIGH EARNERS HAVE BEEN WARNED by Alistair Darling, the Chancellor, that they will be expected to “bear the greatest burden” of economic recovery in this week’s pre-Budget report. Mr Darling is considering levying one-off windfall taxes on bank profits and a super-tax on bankers who receive bonuses above a certain level, and indicated that he expected the rich to pay more in tax. Taxing profits at 10 per cent would bring in around £2 billion this year alone, but while both moves are said to be “on the table,” a final decision ahead of the pre-Budget Report has yet to be taken and the Chancellor has discussed the options with Gordon Brown today. Mr Darling indicated there would be no back-tracking on the new higher rate of income tax, of 50p on earnings of more than £150,000, to be introduced from next April. Amid warnings from business groups about the impact of hefty tax rises on the people he needs to drive growth, he is thought to have resisted calls to extend the rate to those earning £100,000 or more. David Frost, director general of the British Chambers of Commerce said raising taxes on middle and high earners would be “enormously damaging” for Britain at a time when it needs talented people to drive an economic recovery. “The very people we need in this country to create wealth could be located anywhere and will simply go somewhere else. Any windfall levy on banks’ profits would be designed to apply not just to UK banks such as the Royal Bank of Scotland and Barclays, but also to the British arms of global firms including JP Morgan and Deutsche Bank. The decision has gone to the wire, however, as officials have been clashing over the legality and administrative complexity of the plans. Mr Darling is considering two versions of a tax on bonuses, which are predicted to reach £6 billion this year despite the recession. The first would be a levy on payouts above a certain rate, the alternative would be a substantial increases in national insurance charges for banks which pay bonuses. Mr Darling is said to be tempted to exploit voter anger at bankers awarding themselves large bonuses so soon after being bailed out by the tax payer. The City has warned that the move would hamper the ability of institutions such as the Royal Bank of Scotland to attract the talent needed to restore balance sheets and ultimately delay banks’ ability to pay off the taxpayer loans and return to the private sector. George Osborne, the shadow chancellor, said that he was not opposed to a banking windfall tax in principle, but that the Tories would focus on taking steps to stop banks offsetting losses against future tax bills once they began to make profits. The Daily Telegraph also understands that this Wednesday’s pre-Budget report will see the inheritance tax threshold frozen at £325,000, with plans to raise it to £350,000 cancelled. This would allow Mr Brown to continue his strategy of accusing the Tories of seeking to deliver tax breaks for the wealthy. The Conservatives are committed to raising the threshold at which tax must be paid to £1 million. KPMG have suggested that the Government might seek to levy a new 50 per cent inheritance band on estates worth more than £1 million. However, Mr Darling refused to respond to predictions that he would use the PBR to “soak the rich”. Accountants BDO had predicted that Mr Darling would raise the rate at which profits on capital investments are taxed from 18 per cent to 20 per cent. They suggested that there could even be a new Capital Gains Tax rate of 40 per cent on short term gains. Ernst and Young forecast that he could introduce a new 60 per cent band for those earning more than £500,000 a year, raising an extra £2 billion annually. Meanwhile, the accountants Grant Thornton suggested that an extra 70,000 people a year could to be dragged up into the 40 per cent tax bracket if Mr Darling froze the personal allowance on which no tax is due, even though average earnings rose 1.2 per cent. Mr Darling is understood to be keen to give Labour ammunition with which to fight at the next election by painting the PBR as an equality budget. The Chancellor warned of tough times ahead, saying: “On Wednesday I will set out what I think we need to do. That will involve some very difficult choices,” he said. Tomorrow, ministers will make clear that high earners in the public as well as the private sector be made to bear the costs of the recession, with as many as one in five senior civil servants to lose their jobs. In a speech, Mr Brown will promise £12 billion in efficiency savings across Whitehall, including £100 million a year from staff costs. Mr Darling is likely to announce that some departmental budgets will face cuts of as much as 20 per cent while frontline services such as cancer care and teaching are protected. As a first step, he disclosed that plans for a multi-billion pound super computer for the National Health Service would be cancelled. Incentives and stimulus measures will continue, with Mr Darling poised to announce a new scrappage scheme, based on that for old cars, with households being paid £300 to trade in old boilers for new green models. There will also be more money for jobs, after Yvette Cooper, the Work and Pensions secretary, disclosed that unemployment would continue to rise next year, above the current level of 2.5 million. (Daily Mail) – BANKERS HAVE ALREADY FORGOTTEN the lessons of the credit crunch, it was claimed last night. They were accused of recklessly returning to the practices that tipped the world economy towards meltdown only a year ago. Executives are queuing up to collect multi-million pound bonuses and lenders have launched a hard sell on 95% mortgages, triggering a price war on the high street. Politicians accused banks of ‘gorging’ themselves on the back of the taxpayer guarantees that were used to bail them out. Their anger was stoked by the news that Goldman Sachs’ 5,500 bankers in the UK are in line to pocket £440,000 each after the business revealed a three-fold surge in profits. In a separate move, banks and building societies attempted to light a fire under the property market. The Nationwide began promoting its 95% home loans and also cut the price of 34 mortgage deals by up to 0.84%. This followed a move by the UK’s biggest bank, HSBC, to promote a number of 90% home loans. Other major lenders are expected to follow suit. The idea that ‘business as usual’ has returned in the Square Mile was met with consternation by politicians of every hue. Critics point out that Goldmans and other survivors of the 2008 crash can only earn such sumptuous rewards because governments and taxpayers now provide a guarantee that they will not be allowed to fail. Last night Business Secretary Lord Mandelson said the City was witnessing an ‘unacceptable return’ to past practices. He said that the Financial Services Authority could step in to force banks to increase their cash stocks if they are deemed to have handed out excessive rewards. ‘Goldman Sachs and other banks operating in London know that governments around the world, across the G20, have taken decisions and adopted standards which they want to see implemented by every bank,’ he told Channel 4 News. ‘That means not returning to the bonus culture that led banks astray in the past and if they persist in excessive bonuses then the FSA have the power to set that against the capital requirements that they can impose on these banks. John McFall, Labour chairman of the Treasury Select Committee, said: ‘There’s a lot government money sloshing around the system, which firms like Goldman are gorging on. Vince Cable, Lib Dem Treasury spokesman, said: ‘People will be rightly furious to see Goldman Sachs paying out bumper bonuses just 12 months after it was bailed out by the U.S. government. The outcry came after Goldmans revealed that it is on course to shower nearly £14 billion on its workers. The Wall Street giant, which has repaid a £6.3 billion emergency taxpayer loan, saw its profits leap 277% to £1.96 billion between July and September. Some high-fliers could earn bonuses of millions, thanks to the commissions the bank is ‘earning’ for advising the Government. In the British mortgage market, banks and building societies are now taking off the lending shackles. Nationwide is reducing the interest it charges on 34 of its mortgages for those buying a property from today, cutting them by an average of 0.23%. It is also cutting legal fees and registration fees for customers in a effort to drive up home loan applications and house sales. The group’s four-year fixed-rate loan for those borrowing 60-70% of their home’s value will see the biggest reduction, dropping from 5.78% to 4.94%. Historically, a loan to value figure of 80% was considered a prudent figure. However, the last boom saw loans from all the major lenders of 100%. The Nationwide deals will allow new customers buying a home to borrow up to 85% of the value. Existing borrowers who are moving home will be able to borrow-up to 95%. The society believes that loans of up to 95% are valid where they have a long relationship with a customer and they know about their income and spending patterns. It said that it has always offered a 95% mortgage. However, it stopped promoting them once the credit crunch struck, and it also made them unaffordable by imposing very high interest rates. Now, it is beginning a hard-sell of these deals and making them more attractive by charging the same interest rate regardless of the loan to value. Nationwide’s mortgage director, Andy McQueen, said the cuts in rates and fees are about helping people, particularly first time buyers. HSBC said it was offering 90% loans on the basis of its belief that the housing bust is over. Goldman’s extravagant rewards come at a time of rising unemployment and extraordinary strain on family budgets. (Press Association) – The pay of executives at the helm of Britain’s top companies rose 10% last year despite their organisations suffering huge losses on the stock market, it has emerged. The full and part-time directors of the FTSE 100 companies took home more than £1bn between them last year, according to The Guardian’s annual survey of boardroom pay. The directors’ salary increases were more than three times the 3.1% average pay rise for ordinary workers in the private sector and more than double the rate of inflation last year. Their bumper pay hikes came at a time when many of their companies were imposing pay freezes and redundancies on staff in a bid to cut costs. The survey also revealed that the 10 most highly paid executives together earned £170m last year — up from £140m in 2007. The increases in executives’ basic pay helped compensate for falls in bonuses related to the performance of their companies. Overall pay for directors of FTSE companies, including bonuses, fell by an average of 5%, with the average chief executive of a bluechip company now earning a basic salary of £791,000. But taking into account bonus payments, share awards and the value of perks ranging from cars and drivers to school fees and dental work, the average pay package rises dramatically, the newspaper said. Nearly a quarter of FTSE chief executives received total 2008 pay packages worth more than £5m, and 22 directors now have basic salaries of more than £1m. The highest paid boss last year was Bart Becht, chief executive of Reckitt Benckiser, who received £36.8m in pay, bonuses, perks and share incentive schemes. Brendan Barber, general secretary of the TUC, said: ‘The recession has done nothing to stop the gap between top directors and the rest of their staff getting wider every year. It is even more offensive when the Institute of Directors has called for spending cuts that would hit pensioners, the poor and low-paid public sector staff.